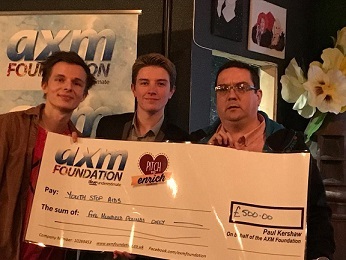 Pitch to Enrich 6th on the 15th February 2019 Youth Stop Aids was Awarded £500 Thanks to the AXM foundation as well as further donations made that night, Youth Stop Aids Manchester now has the financial resource to carry out its activities for 2019. As Sam mentioned on the night the usual Calendar is the speaker tour, this was funded by Restless development before the recent cuts, meaning that before the Grant it would not have been possible to host this year, the speaker tour gets attendances from all ranges of people such as Students, Young business people and very importantly Local MP’s. Now we have the funding, the planning for the 2019 speaker tour in Manchester can begin. On top of this we want a bigger local media presence, as we are a creative action group, we want to be able to fund direct action projects to grab the attention of important figures throughout GM. Last but not least we will be bringing people from the existing groups across the UK here to share their experiences and deliver sessions to people, as well as sharing what we are doing in Manchester with other groups, the Grant will ease up options to travel. Once again we’re extremely grateful and can’t wait to deliver some amazing campaigns. Thank You Lewis Wilkinson. 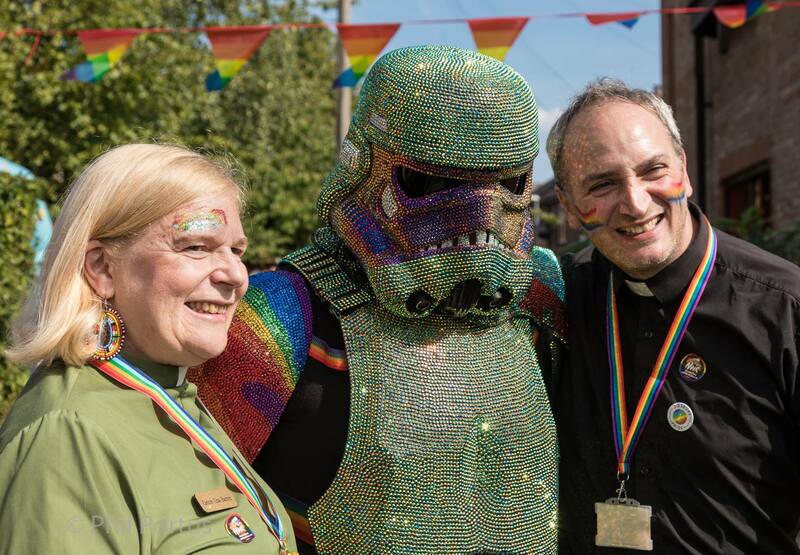 I would just like to let you know that Didsbury Pride was a huge success. From start to finish 1742 people through the gates! This would not have be able to take place without the grant from the AXM Foundation. So a massive Thank You from everyone at Didsbury Pride. Manchester Parents Group A little while ago we were invited to apply to the Pitch to Enrich scheme run by the AXM Foundation. After standing at the microphone with shaking legs we poured our hearts about our love for our LGBT+ children and the whole of the LGBT+ Community. We believe that every person has a right to live their own lives regardless of sexuality or gender identity. We often hear that we have a “tolerant” society, but we want more than tolerance, we want acceptance, and we strive to get this message out at every opportunity. We were up against stiff competition; every group were worthy winners. We were delighted for the winning group; however, we were incredibly fortunate to be given funding of £250. Whilst our group is called Manchester Parents Group, we are here to support Parents, Carers, family members, friends and allies and it’s good to be able to offer new members the support of people who have been on the same journey. We also offer that help and support to members of the LGBT+ community who may just need a “mum hug” or may need some TLC such as an informal meet-up for a coffee and a chat. We also continue to offer educational talks to schools and colleges, both to students and to teachers. We are incredibly grateful to the AXM Foundation for their support and belief in our group. After a difficult time that affected many in Manchester and beyond 2017: The AXM Foundation donated £300 raised during a collection from our supporters at the last 'Pitch to Enrich' event to Martyn Hett's chosen charities. Our thoughts are with his friends and family. Manchester Sharks, Sunday Boys, Oldham Pride, Other Individual recipients that the board of trustees felt worthy causes. The AXM Foundation is also excited to have a tile on the Manchester Bee (Sackville Gardens). Levenshulme Pride was delighted to be awarded funding from the AXM Foundation in 2017. This was our very first Pride. The funding helped us turn the A6 into the Gay6 with balloons and banners and print flyers for our activities. We had almost 400 people marching down the Gay6 in a joyful celebration as well as activities across Levenshulme from cabaret and drag acts to dance, community stalls, poetry, drama, yoga and more. Everything we do at Levenshulme Pride is free to attend so we depend on funding, donations, advertising and sponsorship to make things happen. Thank you to the AXM Foundation for helping make our first Pride such a huge success. The Gay Gordons Manchester is a group that started in 2007 by 3 members who had a passion for Scottish dancing. We are a self-financing community group based in Manchester and obtain most of our money through class fees and a couple of dances per year. Our original Unique Selling Point was dancing to lively Scottish music in our kilts and we have helped raise funds for several charities over the years such as AKT, GHT, Cancer Research and WaterAid. The opportunity arose early in 2017 to take part in an AXM Foundation's ‘Pitch to Enrich’ event. We were ‘pitched’ against some very good causes including Wigan Pride. One of the trustees also mentioned that when the call went out for acts for a fund-raiser, we were usually one of the first to respond. Following our pitch, a cheque to the value of £500 was presented to us on the night. This money was used to buy a digital mixing deck which allowed a couple of laptops/tablet etc. to be used as well as our microphone. We had money left to buy a laptop to be used exclusively for the groups’ recorded music which stands at over 150 CD's. Thanks to the AXM Foundation and we hope to help to raise funds for you in the future too!